The Lodge at Pico Bonito is located in north eastern Honduras about 20 minutes outside the town of La Ceiba near the Caribbean coast. This will be our base throughout our tour with all nights spent in your own cabin on the lush, tropical grounds of this boutique lodge. We will fly into the San Pedro Sula airport where we will be met by our driver and our local guide. The drive to the Lodge is about 2.5 hours but it will be filled with beautiful scenery and we will learn much from our local guide and driver about Honduras on this drive. Snacks, water and soft drinks will be provided as will pillows in case anyone wants to rest. An early evening arrival at The Lodge at Pico Bonito usually affords us time to settle in, to get acquainted with the Lodge’s beautiful grounds, and do some light birding before dinner. Below is our planned itinerary for the tour. However, we may rearrange the agenda for different days depending on the weather or our success at locating certain bird species or other reasons if beneficial for the tour. Changes are at the Tour leader’s discretion. Throughout the morning we will bird areas of tropical, secondary, and gallery forest and plantation areas along the Rio Coloradito. Along this route, diversity is the rule and examples of sightings include Lovely Cotinga; Masked and Black-crowned Tityras, Blue crowned and Turquoise-browed Motmots, Tody Motmot, Keel-billed Toucan, Collared Aracari, Ferruginous Pygmy Owl, Black-cowled Oriole, Black-headed, Violaceous, Collared and Slaty-tailed Trogons, Royal Flycatcher, Green, Shining and Red-Legged Honeycreepers, and 16 species of Hummingbirds are possible including Crowned Woodnymph, Blue-throated Sapphire, Violet Sabrewing, Purple-crowned Fairy, Stripe-tailed Hummingbird, Brown Violet-ear, Green Violet-ear and White-necked Jacobin. In the afternoon, after lunch and a light siesta to nap, read, rest, or visit the spa we’ll explore with our guide along The Lodge’s loop trail system in search of interior rain forest birds. In addition to the Toucan tower at the trail’s beginning, this route offers an elevated ridge platform that overlooks the Rio Coloradito and surrounding forested slopes. We’ll also visit observation Tower #3 which is set amidst an area of bird rich secondary forest and overgrown plantation. White-collared and Red-capped Manakins occur at various locations here and the Grey headed Piprites may be seen as well. Both Keel-billed and Tody Motmots are frequently encountered along this route. Other species include the Great Curassow, Crested Guan, Slaty-breasted Tinamou, Little Tinamou, Scaly-throated Leaftosser, Keel-billed, Emerald and Yellow-eared Toucanettes, Collared Aracari, a host of Flycatcher species, including the Royal Flycatcher, and many of the Trogons, Woodpeckers, Tanagers and Oriole species on The Lodge‟s 420+ bird list. 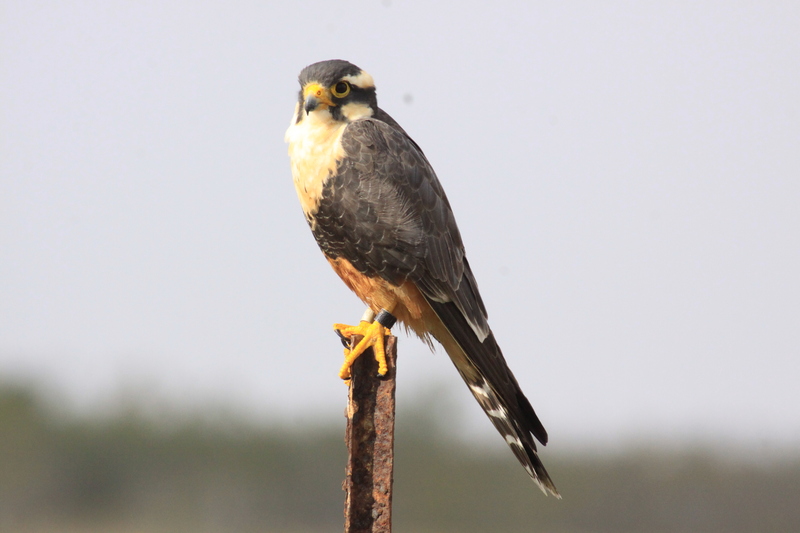 In addition to superb viewing from The Lodge’s towers, this route passes several overlooks along the Rio Coloradito and sightings of Raptor species are possible. Great and Northern Potoo are possible here as well. We’ll meet our guide early for breakfast, and depart for the refuge by 6:30 am. Cuero y Salado Wildlife Refuge is named for the Cuero and Salado Rivers which meet here creating a complex web of fresh and saltwater lagoons before flowing into the Caribbean. The Refuge comprises over 35,000 acres of rivers, lagoons, mangroves, and forests that are home to 35 species of mammals, other wildlife and 350 species of birds. Access into this wilderness is via a small motorized train, which takes us along a century old track through bird-rich ranch lands, marshlands and plantation areas, ultimately arriving at the mouth of the Salado River and the Refuge itself. Birding from the train is always fun and exciting, as the conductor stops to point out species of interest along the way. Depending on season, a variety of raptors, wading birds and edge-habitat species abound along the railway. Once at the Refuge, we will explore the various aquatic and forest habitats from a small, motorized skiff. Our local guide and boat handlers are superb spotters and when needed will silence our boat’s motor and quietly paddle in for a better look or a sought after photo. Possible bird species include the secretive Agami Heron, Jabiru Stork, Pygmy Kingfisher, Boat-billed Heron, Bare-throated Tiger Heron, Gray-necked Wood-Rail, Laughing Falcon, Bat Falcon, Lesser Yellow-headed Vulture, and Sungrebe are but a few potential highlights of a visit to Cuero y Salado. Other wildlife commonly seen here include: Black Howler Monkeys, White-faced Monkeys, Three-toed Sloth, Lesser Anteater, Central American Coati, Agouti, Raccoon, Green Iguana, American Crocodile, and Spectacled Caiman. Lunch at The Lodge. An afternoon to relax, take a nap, get a massage, visit the butterfly farm, or birding on your own from the Lodge’s decks or gardens. After dinner, we’ll be guided around the Lodge’s gardens and plantation areas where Mottled Owl, Vermiculated Screech Owl, Black and White Owl, and both Great and Northern Potoo may be found. We’ll begin this day of birding Honduras’ unique dry forest habitat with an early breakfast at The Lodge, and depart by 4:30 AM. The target of our search, the beautiful but critically endangered Honduran Emerald survives only in remaining pockets of tropical dry forest to the south of Pico Bonito National Park. Descending the southern side of the Park (the rain shadow), cloud forested peaks and pine studded slopes give way to a semi-arid, almost desert-like plain, once dominated by tropical thorn or dry forest. Although endangered, the Honduran Emerald is considered common within its habitat. Our chances of seeing the Honduran Emerald are very good. Our ride into “Emerald country” can be equally exciting, as a surprising number of bird species inhabit dry tropical forest. Along the way, we’ll also visit local wet areas within this arid region. 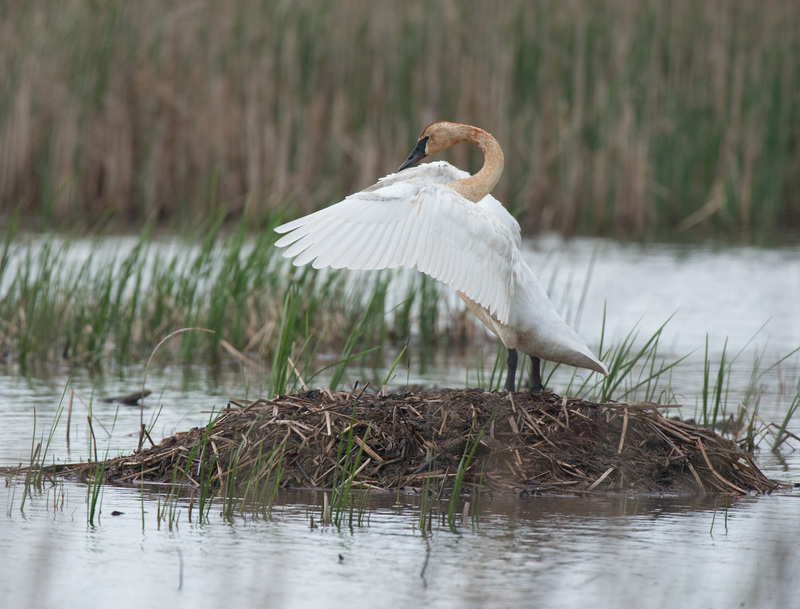 These sites can be magnets for wading birds and other species. We’ll go after species such as; Double-striped Thick-knee, Lesser Roadrunner, Lesser Ground-cuckoo, Beardless Tyrannulet, White-lored Gnatcatcher, White-throated Magpie-jay, Banded Wren, White-bellied Wren, and Stripe-headed Sparrow, and Salvin’s Emerald among others. We’ll enjoy lunch in the nearby ranching town of Olanchito, and return to The Lodge by 4:00 PM. Dinner at The Lodge at Pico Bonito. Rio Santiago Nature Resort is a 15 acre private preserve located 30 kilometers west of The Lodge at Pico Bonito. Its secluded rain forest location and impressive numbers of hummingbird feeders has earned it the name of “hummingbird capital of Honduras”. Throughout most of the year, Santiago’s trails and main garden areas abound with bewildering numbers of some of Honduras’ most well- known hummingbird species. Brown Violet-ear, Band-tailed Barbthroat, Violet Sabrewing, Crowned Woodnymph, Stripe-throated Hermit, Long-billed Hermit, Stripe-tailed Hummingbird, White-bellied Emerald, and Scaly-breasted Hummingbird are among those species that frequent Santiago’s feeders. Black-crested Coquette can also be seen on Santiago’s main trail. In addition, both the spectacular Keel-billed Motmot and Rufous-tailed Jacamar are frequently seen along with Red-capped and White-collared Manakins along Santiago’s trail system. Lunch at The Lodge at Pico Bonito, followed by rest time, a nap, reading, the spa or birding on your own at the lodge. After dinner we will offer an optional Night Walk to look for owls, Potoos, Red-eyed Treefrogs, and other nocturnal wildlife! We’ll meet our guide for breakfast, and depart for The Lancetilla Botanical Gardens by 5:30 AM. Set amidst a coastal valley flanked by low, rain-forested hills. The United Fruit Company founded Lancetilla as a station where tropical fruit and wood trees were studied for commercial value. The Gardens were founded in 1925, and some of that work continues. However this diverse tropical treasure, composed of a mosaic of forest and edge habitats, is today best known for its superb birding. Honduras’ annual Christmas Bird Count is held at Lancetilla, and every December, bird watchers flock to confirm, and add to the Garden’s growing list of colorful, tropical species. The current bird list reads like a who’s who of tropical birds, and includes Motmots and Manakins, Woodcreepers, Warblers, Woodpeckers, Toucans, Tanagers, and scores of others. Little Tinamou, Common Black Hawk, Ornate Hawk-eagle, Ruddy Crake, White-fronted Parrot, Red-lored Parrot, Squirrel Cuckoo, Black-headed Trogon, Violaceous Trogon, Collared Trogon, Turquoise-browed Motmot, Blue-crowned Motmot, Rufous-tailed Jacamar, Great Antshrike, Barred Antshrike, Long-billed Gnatwren, and a host of other resident and migrant species. We’ll complete our morning at Lancetilla with lunch in the beach-side town of Tela, and return to The Lodge by late afternoon. Rest, relax read, get a massage in the afternoon. The world’s second largest coral reef system known as the Meso-American Barrier Reef ! Second in size to the Great Barrier Reef. A true tropical island paradise, the Cayos Cochinos, or, “Hog Keys” is a group of 15 small, remote islands located about 9 miles north of the mainland of Honduras. The entire system of pristine islands and surrounding coral reef is considered a biological reserve and is managed with the help of the Smithsonian Tropical Research Institute and other conservation groups, which operate a research station on one of the larger keys. Research there focuses on the Cayos‟ unique flora and fauna and includes studies not only of the abundant marine life and coral reef ecosystem, but also of the islands’ terrestrial life, some of which is endemic and considered threatened species. We will depart the Lodge at 6:30 AM to the Garifuna village of Sambo Creek to meet our boat captain, and board for a one hour ride to the Cayos. The Garifuna People and Culture originated from West African slaves who washed ashore on the Caribbean island of St. Vincent around 1635 while likely on their way to New World mines and plantations. They intermarried with local populations of Arawaks and Carib Indians, immigrants from South America, to become known as Garifunas or Black Caribs. Garifuna culture combines Caribbean fishing and farming traditions with a mixture of South American and African music, dance and spirituality. UNESCO declared Garifuna language, dance and music in Belize to be a “Masterpiece of the Oral and Intangible Heritage of Humanity” in 2001. Our crossing to the Cayos will be to one of the smaller keys where we will enjoy an hour of snorkeling, discovering, and learning about the incredibly diverse and colorful residents of the coral reef. We will visit some of the other keys for more snorkeling and a short hike. Snorkel, fins, mask and lunch included. For lunch we will have a delicious typical Garifuna meal of native Central American crops and African staples, including fish, chicken, cassava, bananas and plantains. We will dine on the white sand beach of one of the inhabited keys named “Cayo Chachahuate”. Return to the Lodge. Built in 2000, Pico Bonito is the first and only luxury ecological destination in Honduras with Small Luxury Hotel status. Twenty-two simple but elegant cabins built using native woods with vaulted ceilings and furnished in plantation style. Among the many amenities you will enjoy are individual cabins with beautiful hardwood floors, private bathrooms, louvered and screened windows, ceiling fans, A/C and a veranda with a hammock. The main public area offers an open-air environment with fine views of the beautiful gardens. The restaurant boasts good food and a full-service bar. The landscaped swimming pool offers views of the surrounding forest and gardens. Other amenities include an outdoor veranda and a comfortable reading area. After a day of birding you may want to relax with a pampering treatment at the lodge’s full-service spa. Services include deep-tissue massages, hot stone massages, sports massages, and Swedish massages, manicures and pedicures. Therapy treatments include aromatherapy, Ayurvedic, and hydrotherapy. The spa is equipped with a spa tub and a steam room. Nearby optional excursions include a butterfly farm, reptile house and a coffee plantation. Here are links to reviews for the restaurant and lodge. The main lodge area is at 360 ft. above sea level, but the main trails (Loop Trail system) up to about1,000 feet elevation. In terms of difficulty, the Loop trail is about a 6 on a scale from 1 (easy) to 10 (very hard). Degree of physical fitness is more of a consideration than age in walking the trails. If a person prefers an escalator over a flight of stairs, then maybe they’ll enjoy the lower property more. For those who can’t or don’t want to walk the Loop there are plenty of trails on the lower, flatter part of the property that, while not entering primary forest, are superb for birding. Comfortable hiking boots are recommended. Cost of the 8 day journey is $2495.00 per person Double and $2895.00 Single from San Pedro Sula, based on double occupancy and includes: 7 nights’ accommodations, all meals from dinner Day one through breakfast Day 08, group airport transfers, transportation in Honduras, park and preserve entrance fees, professional guides, and miscellaneous program costs. To register for the tour email me to reserve space for the tour. I will reply to indicate that you have a reserved space or that you are on a waiting list. I will then email you instructions for making the deposit, medical information, and waiver forms. NOTE: Additional details for flight, packing, etc will be provided registered participants. If you have questions, please email me. Honduras has low recognition as a birding destination for many birders. However, the American Birding Association had a tour to Pico Bonito Nov. 4 to 13, 2016. Other tour companies are also having regular tours to this beautiful area. 8,000 British nationals visited Honduras in 2015. So, even though you may not have heard or know anything about Honduras, it is a birding destination. Below are some links to guide you in planning your trip. Note: Your passport must be good for a minimum of 6 months beyond August 14, 2017. Like most other Central and South American countries no medical facilities in Honduras live up to U.S. standards and facilities for advanced surgical procedures are not available outside of the major cities. We recommend that you purchase travel and medical coverage insurance before making a reservation for this tour or any tour outside of the U.S. Here is the link for the Center for Disease Control in Atlanta, Ga. Please note that we will be staying at a luxury lodge with many visitors from the US, Canada, and Europe per year and not some poorly maintained lodge. We will not be eating from street vendors but only acceptable restaurants that cater to visitors from the US, Canada, and Europe. Remember 8,000 British nationals visited Honduras in 2015. These facts must be taken into consideration with respect to the CDC suggestions. The areas that we will be in are not known to have a significant incidence of disease, but each person should consult their personal physician for appropriate advice. We will not be spending time in San Pedro Sula, only there as we arrive and depart. We will be picked up and dropped off at the airport by staff of Pico Bonito. We will not be visiting Tegucigalpa, however we may drive through La Ceiba. Like most large cities, these areas have high crime regions. But again, we will not be in these areas. Honduras is served by a number of major airlines, including American Airlines, Continental, COPA, TACA, AeroCaribe, and Iberia. Gateway cities include, but are not limited to: Miami, Houston, New Orleans, Los Angeles, and San Francisco. Plan to arrive no later than 2:00 PM on or before August 07 ; please try to schedule departing flights after 12:00 PM on. From Houston, I recommend the United Airlines flight that Departs Houston at 11:25 am and Arrives in Honduras (Sula) at 1:20 pm. For the return trip I recommend the United flight that Departs Honduras at 2:15 pm. So whatever airline you fly, plan to arrive in Honduras on August 07 no later than 1:30 pm and to depart Honduras no earlier than 2:00 pm on August 14, 2017. If following these time lines we will pick your up at the airport. If you make any other arrangements (arrive earlier, etc.) please let me know. NOTE: Additional details for flight, packing, etc will be provided registered participants. Magee Marsh, a prime migrant trap for North American warblers and songbirds during spring migration, is located in north-west Ohio on the southern shore of Lake Erie; the fourth largest of the Great Lakes of North America. Standing on the famed boardwalk surrounded by large numbers of warblers, grosbeaks, thrushes, orioles, and other songbirds preparing to migrate to their breeding grounds in the north is an unforgettable experience not to be missed. Seeing a tiny jewel of a warbler so close that you do not even need binoculars is a rare and breath taking encounter. Twenty-nine (29) species of warblers are possible with many close encounters with these jewels. 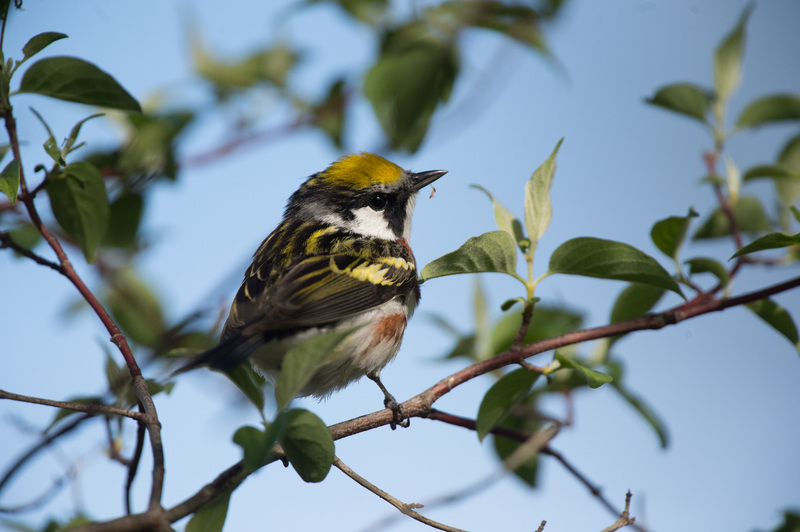 The numbers and the experiences are Magee Marsh’s claim as the “warbler capital of the world”. The boardwalk meanders through a diversity of mini-habitats including thickets, brush piles, damp bog like ground, shallow ponds, and trees and shrubs of various kinds and heights. Each mini-habitat is a favored feeding site for the many migrants. We will walk casually along the boardwalk watching for movement, stopping looking and listening as well as taking cues from the other birders along the boardwalk who are happy to share the birds they are watching. This is a great place for photography and often times birds are so close that a telephoto lens is useless. Even though there are many shrubs and trees, they have only just begun to leaf out so we will have many opportunities for good photos of the birds. Another fun and interesting experience on the boardwalk will be the people. Birders of all skill levels, of all ages, from all walks of life, students of all ages, and a wide variety of styles of dress. The people are just a varied as the birds and also fun to watch! Naturally migration is influenced by the weather and some days have fewer migrants arriving. But if migrating songbirds encounter the expanse of Lake Erie with a north wind or rain, they drop down by the hundreds to rest and feed before making the flight across the lake into Canada where they will breed. With a few good days of birding one can experience Twenty- nine species of warblers, with a possibility of the rare Connecticut and Kirkland’s Warblers, 6 species of vireo, many eastern songbirds, thrushes, flycatchers, waterfowl and shorebirds as they migrate north. We will stop in at the Black Swamp Bird Observatory located at the entrance to Magee Marsh where several vendors will be located. Also along the lake’s shoreline lies Maumee Bay State Park, Ottawa and Cedar Point National Wildlife Refuges. Here we will look for birds that we do not or are rarely see in Texas such as: Nesting Woodcock, Mute and Trumpeter Swans, American Black Duck, Common Merganser, Common Goldeneye, Greater and Lesser Scaup (hopefully we will find them together to compare), Canada Geese, Ringed-necked Pheasant, Black-billed Cuckoo, Great black-backed Gull, Black-capped Chickadee, American Tree Sparrow, Snow Bunting, Bobolink, migrating shorebirds, and Golden Eagle (rare) to name only a few of the 307 species that have been recorded in the region. 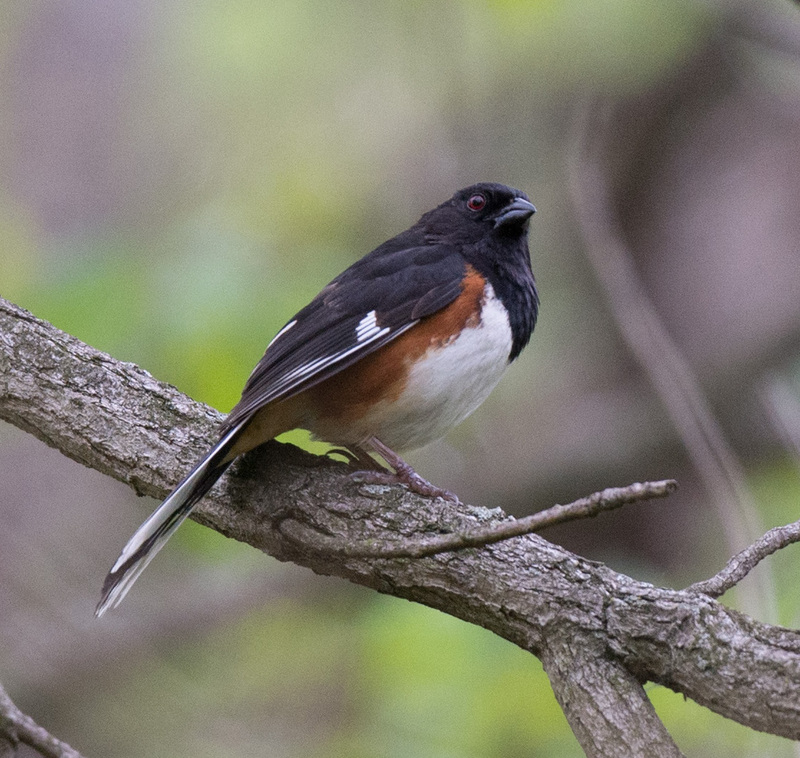 We will spend most of our time looking for warblers and songbirds at Magee Marsh and Maumee Bay State Park, but some time looking for shorebirds, sparrows, and other birds at nearby locations. We will visit Magee Marsh, Ottawa Refuge, Fields, Pastures, and Roadsides in the surrounding area . One day we will drive to a unique area south of Toledo known as the “Oak Openings”. The Nature Conservancy says it is “one of the most important ecosystems in the country”. These oak savannas once covered over 25 million acres and formed a transition zone between the prairies of the west and the forests of the east. Here we will look for breeding Lark Sparrow, Red-headed woodpecker, Blue Grosbeak, Indigo Bunting, Yellow-breasted Chat, Prairie Warbler, Brown Creeper, Red-breasted Nuthatch, Alder Flycatcher, Grasshopper Sparrow, Whip-poor-will and Henslow’s Sparrow (both rare). Each day we will explore various locations for warblers, vireos, flycatchers, shorebirds, and songbirds. The habitat will be quite varied and beautiful. Some days we will spend more time in the wooded sections, other days more grassland/marsh/shoreline habitats. Some days we will have only a 20 minute drive to the site, other days about an hour’s drive. Each night before or after dinner we will review the days birding and I will give details of the next day’s location and other info. Our schedule will remain flexible to take advantage of the movement birds and the possible occurrence of a rare migrant which usually happens. The price in $1445.00 double occupancy. Add $285 for a private room. Four nights and five days. Does not include airfare, meals other than breakfast at the hotel, personal items, tips, medical services or expenses if needed, lost or damaged optics, cameras or other gear or equipment. To register for the trip, please email me per the contact form below. If the trip is not full, I will send you a confirmation with instructions for payment, flight, and other details. If full, I will add you to a waiting list and notify you. Additional information on flight arrangements, hotel, more specific itinerary, packing, clothing, and other details will be provided tour participants. I hope you can join us for this truly spectacular Warbler Experience! Yes! I am interested in this fantastic tour. Please tell me more! Whether this is your first or fifteenth trip to The Valley, it will be a fun and exciting trip with many beautiful birds and unique plants and scenery to enjoy. Photo opportunities will abound on this tour, so bring your cameras! 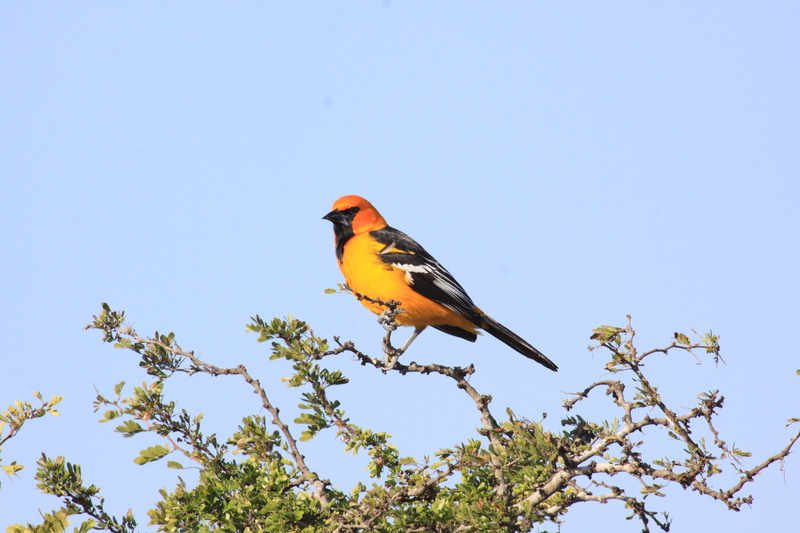 The Lower Rio Grande Valley is a birder’s haven with great birding year round. December, though, is one of the best months to visit, because uncommon-to-rare Mexican species often show up and the weather is nice. This five day and four nights tour will have a relaxed pace with time to observe, enjoy and photograph. To visit all of the area’s birding spots, we would need at least ten days, so we will concentrate on prime birding spots in the eastern and central part of the valley which have the most species or key birds we want to see. Some of the species that we will look for include Aplomado Falcon (rare), Harris’s Hawk, Gray Hawk, Buff-bellied Hummingbird, Tropical Kingbird, Chihuahuan Raven, Long billed Thrasher, Clay-colored Thrush (rare), Altamira Oriole (uncommon), Blue-headed Vireo, and Nashville and Black-throated Gray Warblers (rare). Resident birds we will look for include Plain Chachalaca, Green Jay, Great Kiskadee, Orioles, Green and Ringed Kingfishers, Scaled Quail, Pyrrhuloxia, Black throated Sparrow, Audubon’s Orioles, and Red-billed Pigeon (rare). Less common but possible birds include Verdin, Cactus Wren, and Curve-billed thrasher, among many other species. We should see hundreds of Redheads as Laguna Atascosa, as it is a prime winter area for this species. Also, we will spend some time at Laguna-Atascosa National Wildlife Refuge looking for shorebirds, waterfowl, gulls, & terns. A more comprehensive list of Valley birds will be provided participants. We could see over 100 species, but our objective is not a whirl wind trip to rack up a high count. On day one, we will meet in central Houston at 6:30 a.m. and depart soon thereafter. We will stop at locations known for wintering Raptors and other good birding spots as we enter the brush country. Over the trip days, we will visit Laguana Atascosa National Wildlife Refuge, South Padre Island, Santa Ana wildlife refuge, Estero Llano Grande State Park, and Bentson State Park, among other exciting birding locations. We will let the birds determine our exact itinerary–in other words, we will base our decisions of where to bird on recent sitings. We will keep our schedule somewhat flexible in order to take advantage not just of rare bird sightings, but also the weather and other factors that could affect the birding. One night we may go look for owls, common parauque, and other nocturnal animals, if there is interest. Tuesday December 10, after breakfast we will visit local sites before heading back to Houston. We should arrive in Houston around 4:00 pm. We will have breakfast at the hotel and head out to bird most days between 6:30 and 7:00 a.m. We will stop for lunch at good restaurants we find along the way, and have dinner at great restaurants. We will vary the fare, according to group preferences. Unlike many other tours, ours is small and we will have an opportunity to get acquainted and enjoy the flexibility and comfort of traveling in a small group. Do bring comfortable walking shoes. We will not be doing any hiking, but will be walking slowly every day. The weather in the valley is highly variable–it will most likely be cool in the mornings and evenings and warm during the day. I will provide drinking water, and light snacks, but you are welcome to bring your favorite snacks. Naturally, bring items you need for personal comfort, optics, field guides, and camera equipment. Meeting location for departure and other details will be provided registered participants. Included in the tour package is van transportation costs to and from Houston, hotel room at double occupancy for four nights, continental breakfast for four days, drinking water and light snacks during the day, a great scope, driving and guide services. Excluded items include meals other than those included with room, tips, alcohol, personal items, and other expenses. Minimum number required for the trip to take place is four. Tour Fee is only $ 945.00 per person for double occupancy and a minimum of 4 people. We will attempt to pair you with a roommate of the same gender if you choose, but if this is not possible you will be charged the single supplement fee. If you prefer a single occupancy room, i.e a private room, the fee is $ 1125.00. To register, call me at the number below to confirm that you plan to go, and then snail-mail a non-refundable deposit of $100 per person. Full payment of the tour fee is due by December 01. I’ll be teaching several exciting birding classes this fall and winter at Houston Audubon’s Edith Moore Sanctuary in west Houston. If you’re interested in attending, follow the link at the bottom. In this class we will learn to identify hawks, from the small American Kestrel to the majestic Bald Eagle, and we will learn how and why hawks migrate. Houston is located along a major flyway: we will take advantage of this by spending time in the field practicing identifying hawks in flight as they pass through on their way from their breeding grounds in Northern Canada and Alaska to their wintering grounds in Central and South America. Classes: 7 pm to 8:45 pm Tuesdays September 3 and September 17. Field Trips: 8 AM to 4 PM. Saturdays September 7 and September 21. In this class, we’ll learn the basics of birdwatching which will include learning about the habitat, migration, and behavior of birds, as well as how to identify them by family and species. Get ready to be fascinated by birds! 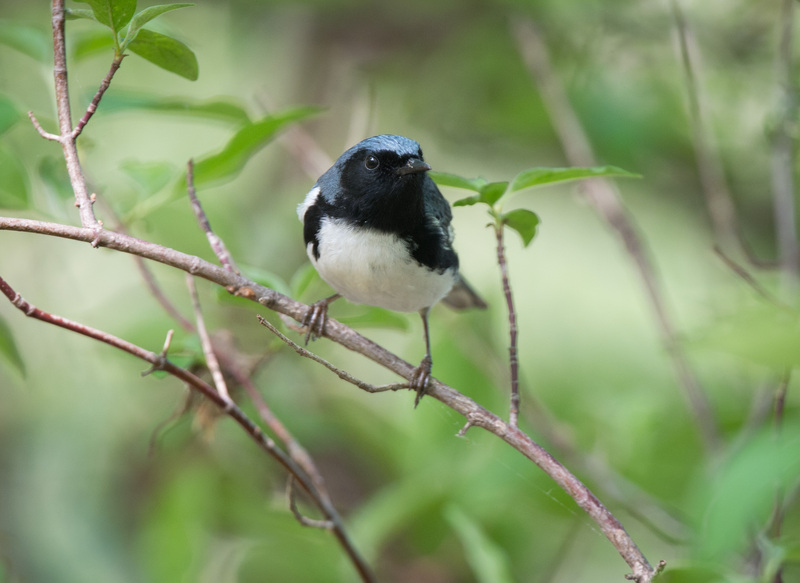 In this class you will not only enrich your enjoyment of the birds in your own backyard, but you will attain a set of skills that will allow you to explore and expand your enjoyment of birds near and far. Classes: 7 pm to 8:45 pm Tuesdays October 8 and October 29. Field Trips: 8 AM to 4 PM. Saturdays October 12 and November 2. 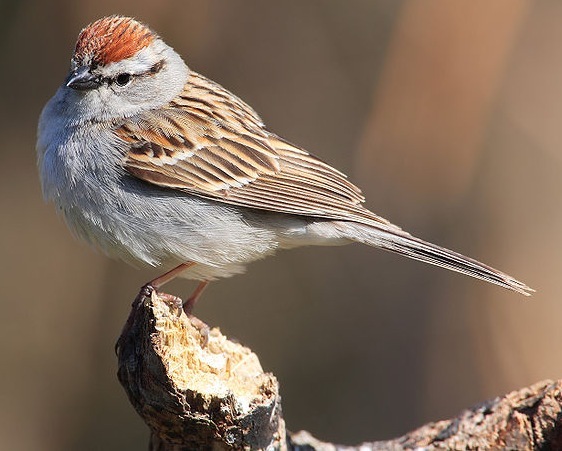 Tired of calling sparrows “LBBs” (or, little brown birds)? In this class, you will learn to.recognize individual species of sparrows. What makes sparrows fun is that they are secretive and challenging to identify! The upper Texas coast is a great place to see wintering sparrows: Come learn about the seventeen different species that occur in our area. Classes: 7 pm to 8:45 pm. Tuesdays November 12 and November 19. Field Trips: 8 AM to 4 PM. Saturdays November 16 and November 23. The Upper Texas Coast is an amazing area for wintering waterfowl. Each year we have thousands of ducks (as many as 24 species) and thousands of geese (5 species possible) and mergansers (2 species). While the identification of male ducks is often straightforward, the same cannot be said of the more cryptically-colored females. Therein lies the challenge and fun of duck identification. In this class, we will learn techniques for separating the many different species of ducks, geese, and the mergansers. Classes: 7 pm to 8:45 pm. Tuesdays December 10 and December 17. Field Trips: 8 AM to 4 PM. Saturdays December 14 and December 21. You do not have to attend all classes or field trips. You may leave the class or the field trip early if you desire. Naturally the more time you invest the more you learn. However, if you miss a class or a field trip you can make it up in any of the future classes. This exciting trip to Maine will focus on the coastal region known as Downeast and Acadia. The coast of Maine is beautiful and rugged with numerous peninsulas and islands creating thousands of miles of shoreline. One of these islands is Mount Desert Island, where the bulk of Acadia National Park is located, a premier Maine vacation destination. On our second day we will drive to the world famous town of Bar Harbor located on Mount Desert Island. Here we will stroll the streets of this resort town and enjoy birding from the harbor as well as the “quieter side” of the island. We may even celebrate with a feast of Maine Lobster for dinner! We will enjoy the picturesque and stunning landscapes of Mount Desert Island Acadia National Park as we bird both the woodlands and the shores of this world renown birding site. Expect breeding warblers, songbirds, shorebirds and other coastal birds. We will also bird Schoodic peninsula that contains a non-contiguous part of Acadia National Park. The loop road runs closer to the water than the road on Mt. Desert Island and we will take this scenic drive as well as bird this comparatively remote area. We may stop at a small local restaurant to enjoy a Maine lobster sandwich for lunch. On another day we will take boat tour for pelagic birds such as Sooty and Greater Shearwaters and Wilson’s Storm-Petrel. 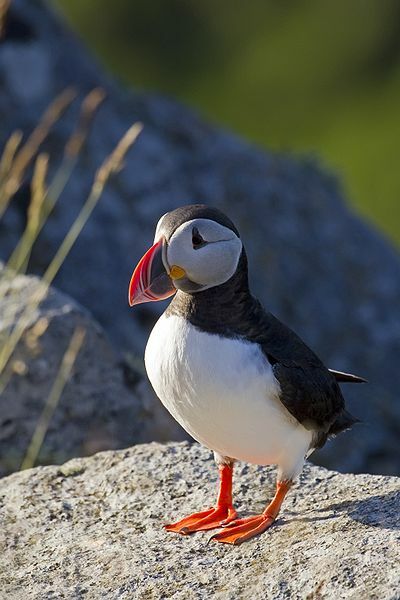 We will also visit an island to see colonial nesting birds such as Atlantic Puffin, Razorbill, Common Murre, Black Guillemot, Arctic and Roseate terns, Piping Plover, Common Eider, and Great Cormorant. For dinner we might sample Maine Lobster as it is prepared in one of the many small towns. How could one visit Maine and not stop in at the iconic outdoor store L.L. Bean? So, one day during our travels, we will make a short visit to update our wardrobe, if needed. Did I mention that we would also stop regularly and sample the many ways that Maine Lobster is prepared? Well, we will! Although the avian spectacle is our reason to visit Maine, the rugged, rocky coastline, picturesque lighthouses, quaint fishing towns, and fresh Maine lobster will also be a significant part of the tour. July 08, 2013 . Monday. We will fly into Portland, ME arriving late that afternoon. Our first night will be spent just outside Portland and en route to our birding locations. July 09-12 Tuesday-Friday. 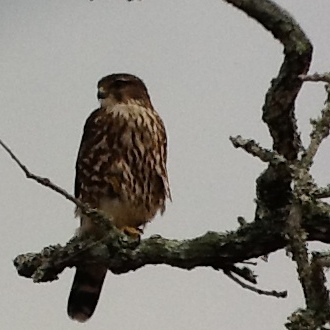 Birding Acadia National Park, Boreal Woodlands, Shorelines, and Boat Tour for Nesting birds, visit L.L. Bean store. Eating Maine Lobster. July 12 Friday afternoon return to Portland. July 13 Saturday. Depart Portland returning to our homes. Tour Pricing: Tour pricing includes ground transportation to and from Portland Maine, room accommodation for five (5) nights, drinking water, guide and driver service, boat tour for colonial nesting birds. Tour pricing excludes airfare, meals (unless breakfast is provided at hotel), tips, gratuities, alcohol, and personal items. What Kind of Heron Is This? I took this picture in Cabo, Mexico over the weekend and while the markings don’t seem quite as described in the guides, Boat-billed Heron is the only thing I can come up with. Any ideas? Thanks for the question. 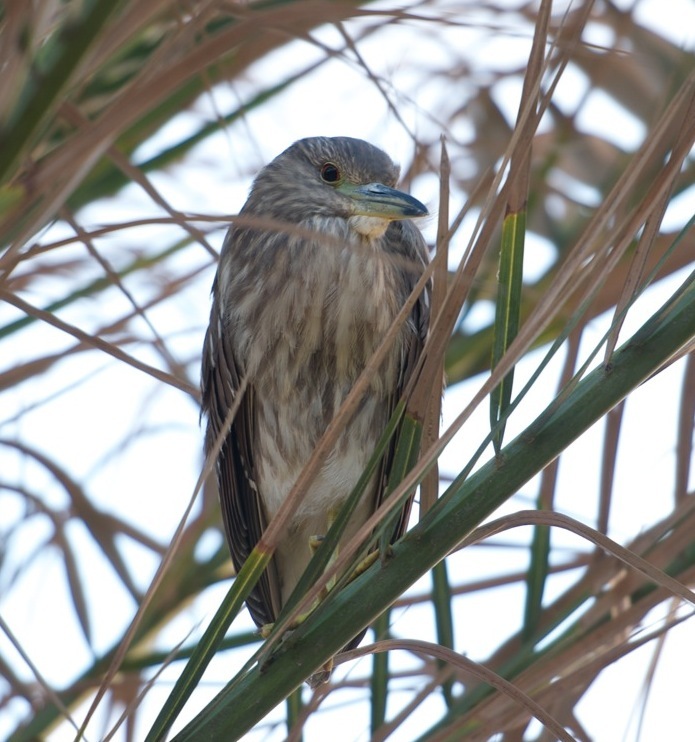 Looks like it’s an immature Black-crowned Night Heron to me. I think a Boat-billed would have a much larger and broader bill, based on what I’ve seen of Boat-billed Herons. Thanks. Happy birding!